The theme for UN World Water Day 2019 (Friday 22nd March) is focused on tackling the water crisis by addressing the reasons why so many people are being left behind. For the people of sub-Saharan Africa, access to water and food security is affected by climate variability. This is particularly true in the African drylands of Kenya, Ghana and Malawi where vulnerable members of society whose livelihoods are highly dependent on subsistence farming and raising livestock, are regularly subjected to extreme hydrological hazards. A major problem, identified by researchers in Geography and the Environmental Science at the University of Southampton, is the lack of locally-relevant research and solutions to address these challenges. With no systematic approach present, the team, led by Professor Justin Sheffield, Professor of and Remote Sensing, has created the BRECcIA project - ‘Building Research Capacity for sustainable water and food security in sub-Saharan Africa’. Thanks to £5.8 million of funding from the UKRI Global Challenges Research Fund (GCRF), BRECcIA’s dual aim is to develop capacity of partner universities in Ghana, Kenya and Malawi, and regional centres in South, East and West Africa, to create and manage their own capabilities to deliver research with impact to relieve poverty across sub-Saharan Africa. Some of the solutions being considered involve the potential use of new technologies – including drones – to help smallhold farms become more sustainable, even profitable, in years to come. 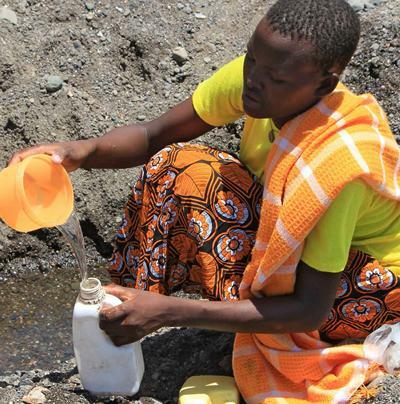 “In addition to periods of drought, almost half of people drinking water from unprotected sources live in sub-Saharan Africa,” said Professor Sheffield. “And the devastating effects of flooding and other damage caused by Cyclone Idai within Malawi this week only demonstrates how volatile daily life can be for some of the poorest people on our planet when there is a lack of locally relevant research or systematic approach with definite solutions; instead we need to build the partnerships and capacity for future local researchers to address and solve these challenges”. BRECcIA involves 28 Co-investigators, 5 research management staff, and to-date has appointed 23 researchers across partner institutes, including the first ever Post-Doctoral Research Associate at Masinde Muliro University of Science and Technology in Kenya. The project is led by Professor Sheffield, along with Geography and Environmental Science-based Co-Investigators Professor Jadu Dash, Dr Jim Wright and Chris Hill. Southampton research colleagues from Social Science (Prof Laura Lewis), Biological Science (Prof Guy Poppy), Electronic Computer Science (Dr Gopal Ramchurn) and the Centre for Higher Education Practice (Dr Julie Reeves) are also represented. “During the ‘inception phase’ of the project, we’ve also mapped and engaged with key stakeholders from government, non-governmental organisations, civil society, media, academia and industry within our study countries,” said Jon Lawn, BRECcIA Project Manager. “In order to maximise the potential impact of our research, we are working with stakeholders to co-design our projects, focusing on local needs whilst incorporating policy or data requirements. “We’re also learning from our partners, particularly through workshops in Malawi and Ghana, that stakeholders value the importance of incorporating gender, governance, economic and ecological approaches to research on climate change, and food and water security,” Jon continued. BRECcIA has recently hosted a two week ‘Training and Exchange workshop’ in Southampton, where Early Career Researchers from across Africa and the UK learnt how to use Hydrological Models, qualitative research methods and Earth Observation and land use classification techniques. The training course was interspersed with generic research methods sessions (Research Design, Public Engagement, Policy (from PP@S) and data management (from UoS library Research data team) as well as contributing to the inaugural university wide GCRF showcase, which brought academics from many disciplines together to discuss potential research ideas and projects to address challenges in overseas countries.